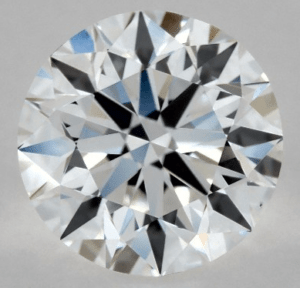 Is Diamond Fluorescence Good or Bad? Find out the Entire Truth! This question is popularly answered by two extremes. It’s either good or bad. And there are two kinds of people who would usually side with these opposing views; purists – those who would only go for the highest, clearest, and brightest stones, and unconventionalists – those who think that the blue glimmer of fluorescence is kinda cool. 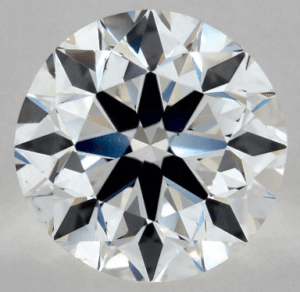 This is where the misconceptions surrounding diamond fluorescence come in. Because the truth is, it’s not just good or bad. It’s not just one way or the other. The real answer is: it depends! Like the 4Cs, fluorescence is all about compromise and individual tastes. And if you learn the ropes, diamond fluorescence can actually be your friend! In this post, I’m going to show you how you can take advantage of the pros while not suffering from any disadvantage of the cons. Let’s get to it in an orderly fashion. In general, diamond fluorescence describes a diamond’s response to ultraviolet light. UV light can usually be found in sunlight, fluorescent bulbs, or night clubs – think black light parties! Now, diamonds contain elements such as nitrogen, aluminum, and boron. When these elements are subjected to UV light, they absorb that energy and jump to a higher energy state. In order to stay physically stable, these elements would have to emit all the excess energy. They do so by releasing photons or the light which is perceived as fluorescence. The most common fluorescence color is blue which applies to around 98% of all diamonds with fluorescence. There are however white, yellow, green, and even pink fluorescence. Ultimately, the color is decided by the physical make-up of the diamond’s inner atomic structure. What are the Levels of Fluorescence? There are different grades of diamond fluorescence namely none, faint, medium, strong, and very strong. A trained eye can distinguish the difference in regular lighting, while for the untrained eye, a UV light is needed to notice the fluorescence. Obviously, “None” refers to the absence of fluorescence, so the presence of this feature starts with “Faint”. Diamonds graded with faint fluorescence are never hazy. Meaning, you can always take a diamond with faint fluorescence and it will not make any difference. 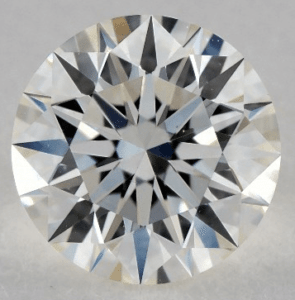 This grade is best with a G or higher color as it can save you money without losing the diamond’s overall brilliance. The diamonds above have the same 4Cs. Although the one on the left has faint fluorescence, it still looks bright and is much cheaper than the gem on the right. Diamonds in this level of fluorescence are usually not hazy. As I have also described in my post about diamond color, you should consider medium blue fluorescence for H-K color graded diamonds. Since the glow is usually blue, and blue complements yellow, diamonds with H-K color can appear whiter. This effect will always be evident when you view your diamond under the sun. On rare occasions, even lower color grades can look hazy or milky if they have Strong Blue Fluorescence. 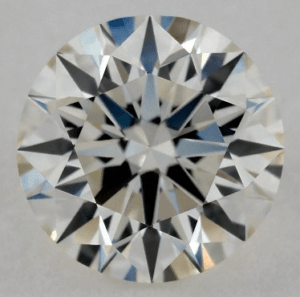 Although the lower the color grade, the less likely for your diamond to appear cloudy. 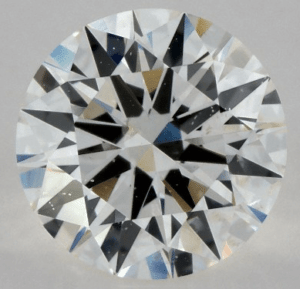 Diamond fluorescence can be bad because it can sometimes cause haziness in a diamond. This would translate to milky spots that can be seen with our bare eyes. Such gems are also referred to as “over-blue diamonds”. On top of that, diamonds with blue fluorescence tend to be cheaper because of their bad rep that’s completely unfounded. It started some decades ago when so-called “blue white” diamonds with blue fluorescence were sold at a premium price. It was originally applied to high quality diamonds, but was later on used by salespeople to market lower quality gems with blue fluorescence. This lead the Federal Trade Commission of the USA to ban the “blue white” label. Since then, diamonds with blue fluorescence are branded with a bad name – especially by those who don't do their homework. 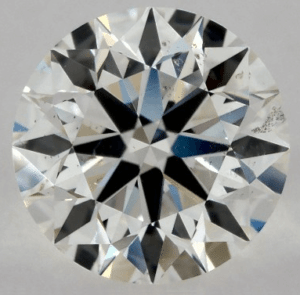 In cases where diamond fluorescence doesn’t cause any haziness, it would only have pros. Once you’ve followed my advice above, you can enjoy the benefits of a blue fluorescent diamond. 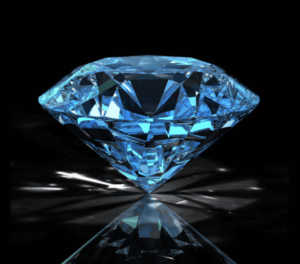 One of these benefits is the fact that most blue fluorescent diamonds are cheaper by 10% – 15% than a comparable gem without the blue fluorescence. 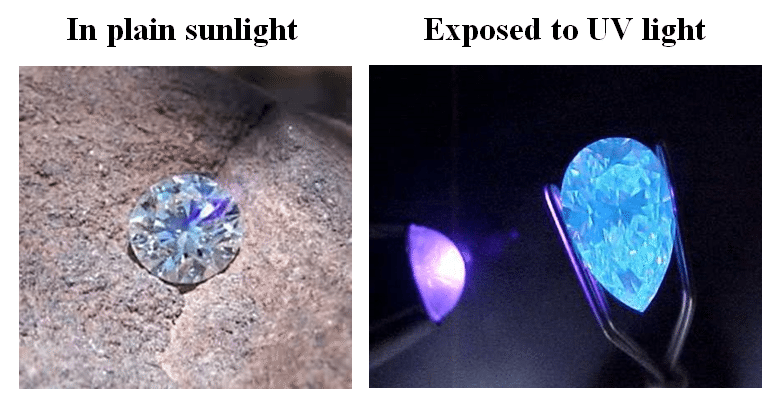 Furthermore, you might not be able to see the effect in usual lighting conditions, but once the diamond gets exposed to UV, it will shine in an icy blue way. The fluorescent effect under UV light can be pretty impressive as it can make your diamond look exceptional! 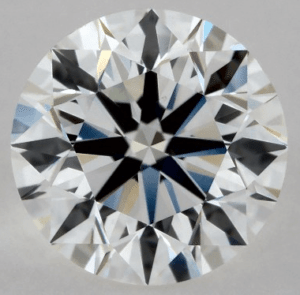 So, What’s the Fuss About Diamond Fluorescence? The main confusion on diamond fluorescence is the study performed by GIA in 1997. Its conclusion states that “fluorescence had no over-all effect on color appearance or transparency”. However, the same study also noted that the observations showed a clear trend for diamonds with weak fluorescence to be considered more transparent than gems with strong fluorescence (page 256, figure 7). On top of that, the study does not also deny that 50% of all participants did notice a difference in transparency between fluorescent and non-fluorescent diamonds. I know for a fact that fluorescence cause haziness in diamonds, that’s why I find the conclusion quite contradictive and all in all, not really representative. 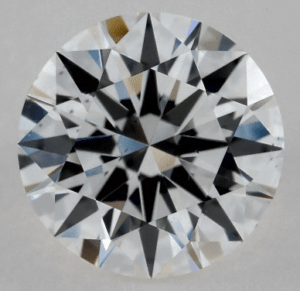 So, if someone tries to convince you that GIA has proven that diamond fluorescence doesn't have any negative effect on the quality of the gem, you may refer to this study. All things considered, diamond fluorescence is not a big deal if you follow the guidelines above. There’s no denying that its icy-blue effect can definitely add soul to the diamond. It can only be a nuisance if your gem has a Strong Fluorescence in D-F color or Very Strong Fluorescence in G-H colors – since they don’t have sufficient body color to counterbalance the level of fluorescence. A great place to buy diamonds with Blue Fluorescence is James Allen. No other place will let you view all of their diamonds in high definition 360° videos and 40x magnification. This way, you can safely pick a gem with fluorescence that doesn’t possess haziness. And if you prefer a Hearts and Arrows Diamond with Blue Fluorescence, there’s Brian Gavin’s Blue diamonds. All gems have been personally picked by Brian Gavin himself to ensure superior optical performance. If you have any more questions, just drop me a comment or write me a mail!